Author: D. J. D. AUTHOR OF "OUR PICTURE BOOK." Title: PETS ABROAD or Frank and Ethel's Travels in America and Canada. Description: London, S.W. 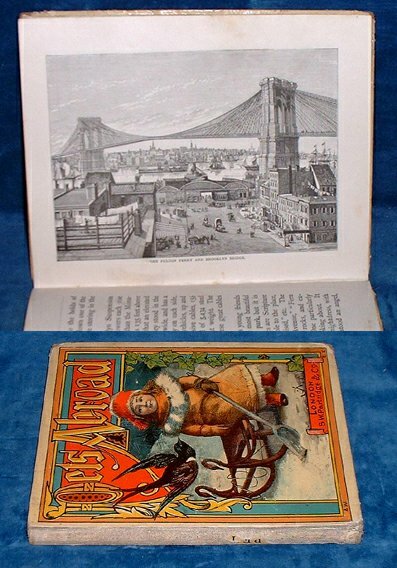 Partridge & Co. 1887 Almost every opening illustrated including full page of American and Canadian towns, scenery and novelties. . Square octavo glazed pictorial boards (tips worn/spine paper lacking) Endpapers with publisher's new items for 1887 and 1888. Half title with fancy name in red and black dated 1888 Ethel Hooper. Frontis + titlepage +vi +96pp + further publisher's catalogue to rear yellow end papers and to rear of cover. *Very neat and interesting travels in America and includes some historical chapters.